A modern retrospective look at Val Lewton's films reveal a master of suggestion. Lewton's films rarely offered up well-defined horror or blatant supernatural elements. Instead, Lewton skillfully suggested danger, allowing the viewer's imagination to fill in the blank. Using lighting and shadows to create dark, broody atmosphere and shadows to suggest the shapes of threats, Lewton's films played on psychological fears and human emotions, allowing the audience to essentially scare themselves, and laying the groundwork for later horror masterpieces such as The Innocents and The Haunting. However, even a master can have a bad day. The Curse of the Cat People, which exemplifies Lewton's style of horror while failing to actually coalesce into anything resembling terror, probably accounted for a bad week. 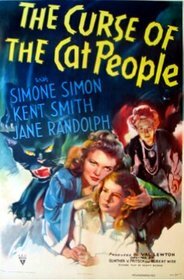 Curse of the Cat People tells the story of an odd little girl, Amy, who is so caught up in day dreaming that she doesn't have any real friends, unless you count the creepy old lady who lives in the local “haunted house”. When Amy, lonely and distressed, is given a ring by the aforementioned creepy old lady, she uses it to make a wish – she wishes for a friend. Her wish is granted, and Amy suddenly finds herself doted on by a beautiful woman no one else can see. Of course, her imaginary friend just happens to look like her father's first wife, who went crazy, killed a man and then let herself be eaten by a panther, but hey, you take what you can get, right? While Curse of the Cat People is technically a sequel to the 1942 film Cat People, its associations with the previous film are tenuous. The title was actually chosen by the studio, despite Lewton's objections, and has very little bearing on the film's topic. Amy is the daughter of Oliver and Alice, the two lovers who survive the first movie, and Amy's imaginary friend resembles the main character of Cat People. However, that's really where the similarity ends. The Irena of Curse is benevolent and sane, instead of broody and unstable; the film's main threat is purely human, rather than supernatural. Aside from the fact that the memory of Irena haunts Oliver and affects his relationship with daughter, Curse is simply a continuation of the lives of the characters, rather than a continuation of the themes. Theoretically, this distance from the original Cat People should have freed Curse to explore the same terrors of Cat People in new and innovative ways. However, Lewton, likely out of spite, threw all thematic continuity between the two films to the wind. The supernatural in Curse is not only easily and readily explained away by child psychology, it's never threatening to begin with. Even if Irena's appearance to Amy were ghostly, she's rather friendly and cuddly. Instead, the threat to Amy if from another disgruntled daughter, Barbara, the grown daughter of the creepy old lady who feels abandoned by her mother and replaced by Amy's friendship. While it is a disturbing picture of what Amy could become if things between Oliver and her do not improve, Barbara only actually threatens Amy for about 30 seconds before Amy hugs her and Barbara is so moved, she walks away and leaves the girl alone. That's right. The main threat of the movie has been hugged into submission. Interestingly enough, screenwriter DeWitt Bodeen actually wrote an original ending that involved a complicated chase scene, with Amy struggling from room to room to escape the murderously jealous Barbara. It was Lewton himself who discarded this ending, instead writing the overly sappy, “Love Saves the Day” ending, including a tacked-on reconciliation between Amy and her father, in which Oliver professes to see Amy's invisible friend. It may be poignant from a psychiatric viewpoint, but from a horror-fan perspective, it's a bit disappointing. Now, the argument could certainly be made that I'm approaching this all wrong, that this isn't meant to be a horror film at all, but rather a drama about a child whose fantasy world intersects with real life. However, this argument would be more convincing if Lewton hadn't set-up the elements for a horror film. The story moves from threat to threat, following little Amy as she meanders into possible danger, discovers that danger is fluffy and harmless, and then meanders on. The “ghost” of Irena turns out to be an imaginary friend, the creepy old lady turns out to be an eccentric, retired actress, and the menacing daughter that plans to kill Amy can be beaten by kindness. 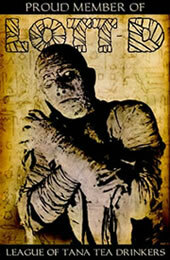 If the film had been intended as something other than horror, the horror elements should have been left at home. Instead, the audience is left confused, wondering why these elements are even in the picture, let alone built up into major plot points. By negating any threat to Amy, Curse lacks any real sense of suspense or mystery. However, since it's built-up to be at least horror-esque, it bypasses insightful and interesting on its way to directionless and disappointing. However, despite its abject failure as an engaging film, there can be no doubt that Curse of the Cat People is a Val Lewton production. Lewton's trademark insinuation and suggestion permeates Curse of the Cat People. When Amy wishes for a friend, the whole set darkens, as if a cloud has passed over the sun, and Amy steps forward towards something we can't see. Later, in her room, she calls to her friend, and a woman's shadow begins to spread across Amy's bed, as a soft humming fills the air. As the camera pulls back, we can see the figure of a woman standing next to Amy, but we never see her face and, as such, are unable to judge her intentions. This mysterious, unseen presence is definitely there - the changes in ambiance as well as indications of her physical manifestation leave no doubt - but it's up to the imagination (until child psychology ruins the day) to fill in the blanks, to determine who she is and why she's come. Lewton's skill in this area is not limited to the appearances of Irena; Amy's visits to the old house are equally moody. The large, dramatic stairways and high ceilings dwarf the young girl. Diminished by the entryway, Amy makes her way to a curtained side room, which is swathed in shadows, shapes and impressions looming up around her. When she turns, obviously frightened, to get a better look at her surroundings, she finds herself face to face with a dead cat holding an equally dead bird in it's mouth, carefully preserved by the magic of taxidermy. When young Amy finally looks like she might die of fright, we hear bright laughter and the curtains on the window open, flooding the room with light and dispelling the tense, boding atmosphere of the room. We've been played, and, personally, I loved every minute of it. The final scene that really deserves mention is when the old lady, having now lightened the mood and the room, tells Amy the story of the Headless Horseman, a local legend. The scene darkens as she begins to describe the famous spectre, her face lit from beneath as if she were holding a flashlight to her chin. Eyes wide, she encroaches on the camera and, growing closer as the sound of hoof beats begins to build. When Amy leaves, returning the bright world outside, we're left with the image of that storytelling, the sound of imaginary hoofbeats still pounding silently in our ears. Lewton may have failed at creating suspense in the film as a whole, but that scene reminds us that he hasn't quite lost his touch. Despite a few shining moments of brilliance, The Curse of the Cat People is unfocused. Lewton, attempting to appease studio execs, included enough horror elements and cat motifs to imply a horror film, but was so focused on creating his own film, he abandoned those foundations halfway through. The result is a meandering, confusing and often maudlin film that, at times, is too sappy even for a Hallmark card. From a historical perspective, it adeptly displays the talents for which Val Lewton is famous. I just wish there was more to recommend it.